Now in its 10th year (! ), the Dallas Art Fair, which takes place in April, has released the list of the fair’s 2018 exhibitors. There are some notable newcomers to the fair, and a some head-scratching omissions. There will be just about 100 galleries in this iteration. Also, right now the word is that the fair will stay at F.I.G. building, downtown, through 2019. The newcomers the Dallas Art Fair seems most excited about are as follows: James Cohan Gallery (New York), Van Doren Waxter (New York),Casey Kaplan (New York), Paul Kasmin Gallery (New York), Rachel Uffner Gallery (New York), Green Art Gallery (Dubai), The Hole (New York), Luhring Augustine (New York/Brooklyn) and Praz-Delavallade (Los Angeles). The DFW region will be represented by AND NOW, Bivins Gallery, Conduit Gallery, Cris Worley Fine Arts, Erin Cluley Gallery, Galerie Frank Elbaz, Liliana Bloch Gallery, PDNB Gallery, Talley Dunn Gallery, Valley House Gallery, and William Campbell Contemporary Art. Other Texas-based galleries include both Inman Gallery and Sicardi Ayers Bacino out of Houston, and Lora Reynolds Gallery out of Austin. Distressingly, Ro2 Art of Dallas is not on the list. It’s been consistently charming and popular with both Dallasites and out-of-towners in past years, and an excellent showcase for local artists. Gagosian, by the way, is not returning this year. Galleries from 30 cities are participating. For the full list, go here. 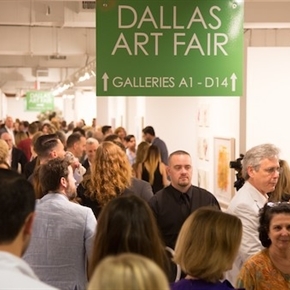 The Dallas Art Fair takes place in Dallas from April 12 through April 15, 2018, at Dallas‘s Fashion Industry Gallery (F.I.G.). For more on the fair, please go here.